The portrait-painter and etcher William Nicholson was born in Ovingham-on-Tyne, Northumberland, on Christmas Day 1781. His family transferred to Newcastle when his father was appointed Headmaster of the city's Grammar School. At an early age, though, Nicholson appears to have moved to Hull where he made his artistic debut, painting miniatures of officers garrisoned there. He was almost entirely self-taught, learning his craft through the close study of artworks in private and public galleries. He subsequently returned to Newcastle where he received many commissions to paint portraits of the old families of Northumberland. In 1808, he began to exhibit at the Royal Academy, continuing to do so until 1822. 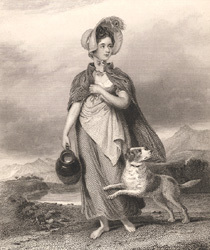 By 1814, Nicholson, whose mother was a Scot, had moved to Edinburgh where he set up as a miniaturist and painter in oils. Soon, however, he began to specialize in watercolour portraits. 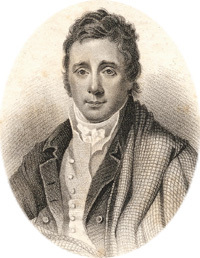 Early subjects included the actor Daniel Terry and the poet and novelist James Hogg. In 1818 he began to publish a series of Portraits of Eminent Scotsmen, etched from his own portraits and those of other painters. Besides Scott and Hogg, the subjects included the writers Robert Burns, John Wilson ('Christopher North'), and Lord Jeffrey, the painters Sir Henry Raeburn, the divines Alexander Carlyle and Alexander Cameron, the engineer James Watt, the architect John Playfair, and the song-collector and composer George Thomson. 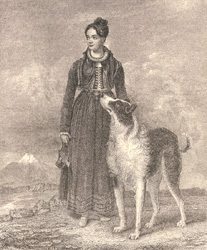 In 1821 Nicholson married an Edinburgh woman Maria Lamb and, in the same year, contributed to the first modern exhibition of the Institution for the Encouragement of the Arts in Scotland. In 1826 he was among the most active founding members of the Scottish Academy of Painting, Sculpture, and Architecture. At its first meeting he was elected secretary, a position he held until 1830. He contributed to each of the Academy's Exhibitions until his death by fever in 1844, latterly specializing in genre, landscape, and coast subjects rather than portraits. Nicholson painted three (possibly four) watercolour portraits of Scott in 1816-17 and etched a further portrait from his own design in 1817. Click here for a description, with links to images. In addition, Nicholson painted watercolour portraits of Scott's two daughters, Charlotte Sophia and Anne. Click on the thumbnails below to see full-size images of engravings of these paintings by George Baird Shaw.